Yes, 2 for P499! .. Yellow Cab’s Pizza Delivery Promo! Get 10” Manhattan Meatlovers Pizza + 10” Cheese Pizza for only P499? Order online at delivery.yellowcabpizza.com or call 789-9999 now for this delivery deal from March 22 to March 31, 2019. 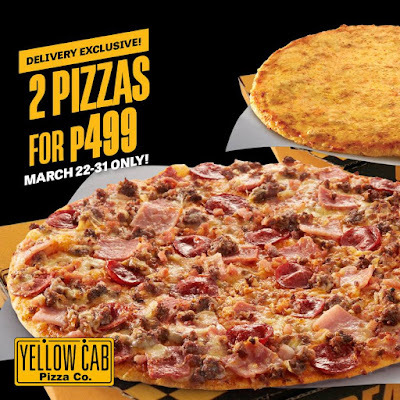 Promo available in all Yellow Cab Metro Manila delivery stores only. Get 1 10” Manhattan Meatlovers Pizza and 1 10” Cheese Pizza for only P499. This promotion is available in all Yellow Cab METRO MANILA delivery stores only. Available for Delivery transactions only.